Will the future of farming look more like Star Trek than Footrot Flats, with drones, probes and farmers behind screens rather than tractor wheels? New Zealand potato growers produce a reliable yield, with a great deal of hardwork and many growers also rotate their crops with other vegetables, which means at times, other heavy feeder crops, may reduce soil nutrients and result in a seemingly good potato yield, yet lacking essential nutrients. In addition, we know NZ soils are naturally deficient in certain nutrients. Unpublished work in New Zealand has shown the levels found in NZ potato crops will vary according to the variety, the area in which they are grown and on seasonal factors. Mid season nitrate-N levels will drop to 6,000-10,000 ug/g, P to 0.20-0.40% and K to 8.0-12.0%. Late season levels are normally 3,000-6,000 ug/g for nitrate-N, 0.15-0.25% for P and 5.0-9.0% for K.
Magnesium levels tend to be constant throughout the season. Normal leaf magnesium levels are now lower than those quoted in the overseas references (typically 0.5 – 1.0%). Crops in N.Z. showing no visible stress symptoms have been found to have magnesium levels as low as 0.20%. Potassium levels also tend to be higher in N.Z. crops, particularly for North Island crops and in 30 cm tall plants. Potatoes are regarded as having a medium nitrogen requirement and are semi-tolerant towards boron. Soil pH should be maintained in the range 5.4 – 5.8. While potatoes will thrive at soil pH levels of 6.0, a lower pH is normally recommended to suppress development of potato scab. Results for copper, zinc and manganese in leaves sprayed with fungicides will not be reliable due to adhering spray residues on the leaves. Iron levels cannot be reliably assessed from leaf analysis, due to the presence of physiologically inactive forms of iron within the tissue. Also, soil contamination of leaves growing near the ground may elevate total iron results. Nutrients are important not just for product value, but for plant resilience in the field. A well-grown crop is a valuable asset. To achieve the full value from that asset, requires good management, as well as good environmental conditions. We cannot control what the climate throws at us, even more so in these times of extreme weather events, but we can control what we feed our crops in an informed, economic, smart way, whilst minimising nitrate leaching. In addition to the tried and true methods of testing nutrient levels in soil, it is useful to look at a further under-utilized tool; plant analysis. Leaf testing has been the method for plant analysis during the growing cycle and can provide very useful information to support the fertiliser and management decisions and attain the targeted crop, yield, quality and resilience. A regular leaf analysis monitoring programme, can remove the guesswork and is a sound risk-management tool, however using smart technology to analyse plants in the future may save farmers time and money. PNZ is undertaking trials of hyperspectral imaging using drones. If these trials prove an effective method for assessing plant physiology and nutrient content, then farmers will have a more efficient tool to ensure fertilizer is applied selectively, where it’s needed. Plant analysis using hyperspectral imagery can indicate deficiencies, with the opportunity to then apply nutrients identified as being low, to maximize the plants full potential. This new tool, links to our precision agriculture methodologies, meaning farmers will apply fertilizer only to deficient areas within paddocks. PNZ is also currently trialing electronic probes in three locations, to provide live data on various soil conditions. One of the ways these probes will assist farmers, is by indicating nutrient levels, so it is then clear how much fertilizer to apply and where in the paddock it is needed. 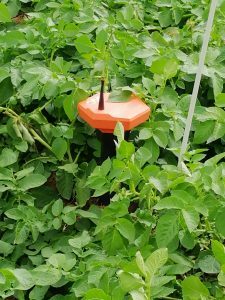 The future of potato farming is looking smart, with these new tools just on the horizon and NZ leading the way with exploring the benefits of Teralytic probes, by being the first country outside the US to have them in the field.